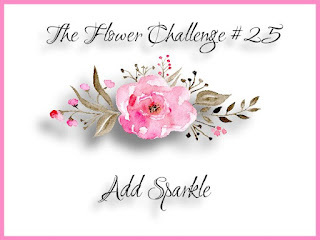 Hello everyone: It's time for a little reminder for THE FLOWER CHALLENGE "Add Sparkle" Challenge, so here is the card I made to inspire you to come along and play with us. You can also go and check out the reminder post for even more inspiration from my teammates' amazing cards, I hope to see you in the gallery. 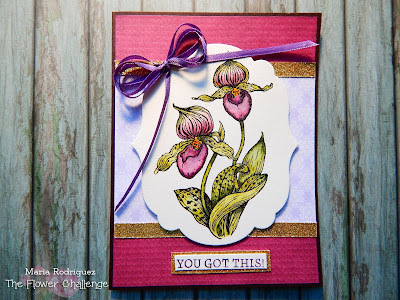 This card is made with a Power Poppy set called Orchids Rock which has two amazing images and a bunch of inspiring sentiments. I picked the image of the Lady Slipper for my card, I just love the look of these beautiful flowers. I stamped this image on a die cut piece of watercolor paper with Versafine black ink and clear heat embossed it then I colored it with SU markers and an aqua painter. The pattern papers are from a retired line from Lili of the Valley, the gold glitter paper and the ribbon are from my stash. Most of you know how hard it is to photograph Wink of Stella so here is a closeup of the image where you might be able to see the lovely shimmer. 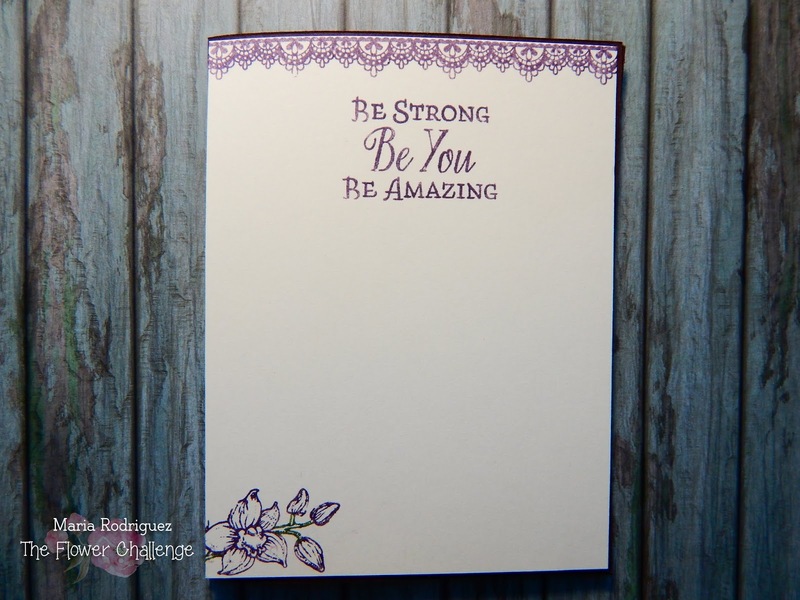 The Sentiment and the little Orchid on the bottom corner are from the same set, the border is from a retired SU set called "Delicate Details", I love this beautiful, lacy images. So I hope you stop by THE FLOWER CHALLENGE reminder post for more awesome inspiration from my teammates. Labels: Power Poppy "Orchids Rock", The Flower Challenge "Add Sparkle"
Ohhhh, Maria! These orchids have been sitting out on my table for a while because I had a plan to color them, but other things have gotten in the way. I don't know if I could ever color them so prettily as this. They're perfect! Even better with the sparkle. How I do love this gorgeous card! Really pretty ! The colors you chose are adding to the beauty of this special flower. The Wink Of Stella is a perfect extra ! incredible watercoloring choices. Looks like a beautiful botanical print! What a beauty! You definitely need to keep this in your art room it's so beautiful to enjoy every day! No green thumb needed! Beautiful image and more beautiful coloring, Maria!!! Lovely layout and the added elements make the card so fancy!!! so pretty and very elegant Maria....well done mf. I love this card too Maria! 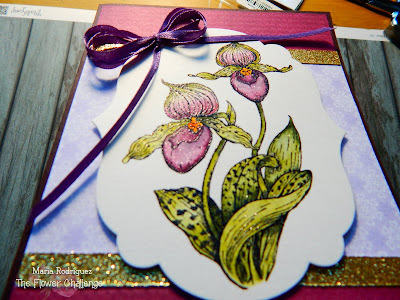 Such a beautiful flower and I love the color you used for it as well and the way you incorporated it into your card. Gorgeous job!